You are the boss of that dough. …Julia Child, American chef, author, and TV personality. Bakery can extend into past years of history. Romans first came with the art of baking and due to globalization it spread worldwide. Baked foods are healthy, tasty, and flavorful. They are in demand on special occasions such as weddings, parties, and social feasts. Baking is a manner of cooking food by exposing it to direct heat or heated stones for long time under controlled temperature. Baking is not just limited to cakes, breads and biscuits but practically a wide range of sweet and savory foods such as pies, cookies, tarts, Baati (Indian baked bread consumed in North-West region), Rodgaa (Indian baked bread consumed in east Maharashtra region of India), and snacks can be baked. Baked food often comes up with aromatic food. 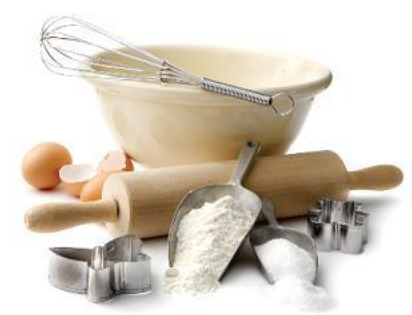 Flour − It is the basic ingredient of baking cookies, breads, cakes, muffins, pizzas, tarts, and pastries. Its variants are self-rising flour, wheat flour, all-purpose flour, cake flour, etc. Essence − It is an extract acquired from a plant or other matter used for flavoring food. Some typical essence are almond, vanilla, saffron, lemon and rose. Margarine or Butter − Margarine is made of refined vegetable oil, water, and milk. Butter is made of processing milk. These both are called shortening. Sugar − It is used as food sweetener. Eggs − They are used as leavening and binding agents and they can bring moisture in the cakes. The chefs need to add either yogurt or applesauce in eggless cakes. Baking Powder/Yeast − It is used as a rising/leavening agent that gives softness and fluffy texture to cakes and breads. The baking powder is white fine powder made of Sodium Bicarbonate, Potassium Bitartrate, and corn starch. The yeast comes in two variants − dry and liquid. Cocoa Powder − It is used for introducing chocolate flavor to the food. Chocolate slabs − They are used for acquiring flakes by grating and then using the flakes for garnishing and decorating cakes. They come in the variety of chocolate-milk-sugar proportion. Now chocolate drops or chips are also available in the market. Fruit Jams − They are used for decorating sweet baked products. Milk − It is used for softening batter for the cakes, breads, and cookies. Salt − A pinch of salt is added into batter of sweet baked products to balance the taste of Baking powder and sugar. Ovens − They are used as a heating chambers for baking. Direct heat large kilns and modern electric ovens are used in food preparation units. The electric ovens provide high degree of precise temperature control and uniform heat. Mixing Machine − It is used to mix all bread or cake ingredients together into soft dough or batter. Tins − There are tins with various shapes and sizes used in baking. They create the resulting baked product in attractive shapes. Icing Bag with Nozzles − The icing bags hold the icing. They are used in decorating cakes in a large variety of ways using nozzles of catchy shapes and widths. They provide a great way of filling small glasses and molds in a sophisticated manner. Baking Parchment − It is a cellulose-based paper used as a non-stick surface. It is often thin and disposable. Knives − Bakery knives are used for cutting loafs, cakes, and handling pieces of cakes. Cake Stands − They are required to keep cakes of multiple tiers. Some of them are rotary. They provide circular motion that makes the process of cake decoration easy. Spatula − They are flat tip spoons, used to fold the batter and fill the icing bag. Spatulas often have rubber tips. Bread fabrication is a complex process. Once started, it cannot be interrupted, as timing is very important for bread making. There are 12 important stages of baking a bread. During this stage, the chef assembles all the required ingredients and weigh them properly to ensure a good quality final product. The chef selects an appropriate flour and sieves it. The chef also prepares yeast mixture by adding right amount of water of right temperature into the dry yeast. Mixing the ingredients is not as simple as it sounds. There are various factors that need consideration such as room temperature, flour temperature, speed of machine, the timings of adding various ingredients like margarine, sugar, yeast etc. During bulk fermentation, the yeast acts on sugar in the flour and releases carbon dioxide and alcohol while it respires. The gas makes the flour dough rise and the alcohol brings flavor to the bread. The longer the fermentation, the more intense the aroma. Folding a dough is superior to simply punching it down. 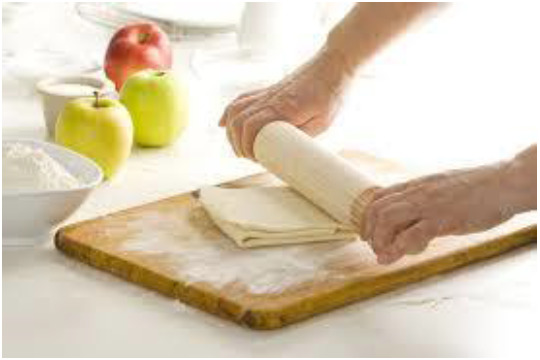 Folding involves gently kneading the dough into parts and new rolls. Degassing is a very important piece of the bread jigsaw. It removes some of the carbon dioxide and redistribute the food for yeast so that the yeast can resume to their meal. A large dough is divided into several smaller portions to make loaves or buns. At this stage, the dough is kept for a while so that the gluten can rest and shaping becomes easy. This time is not more than a few minutes. At this stage, the baker shapes the bread for various looks such as loaves, buns, begels, baguette, rolls, sticks, and other various shapes. Shaping affects the physical form of the bread. Once the dough is made into a desired shape, the baker keeps it for the final fermentation before it enters the oven. Proofing affects the chemical form of the bread. The baker preheats the oven and keeps the doughs into it under a controlled temperature. In this stage, the baker takes out the bread and sets on the racks for exposing it to the air for cooling. Some breads such as baguette are eaten at room temperature. The bread is thus ready to be consumed. Cakes are named according to the way they are prepared. They contain fat such as butter. It starts with beating sugar and butter together until the sugar dissolves partially and then adding dry and wet ingredients alternatively. The resulting cake is light and rich with moisture. For example, Pound cake made with a pound each of butter, sugar, eggs, and flour. They also contain butter and can be made by arranging layers of different butter cakes. For example, Golden cake, Birthday cake. They do not contain fat or leavener such as baking powder. The preparation starts with whipping eggs or egg whites such that it becomes fluffy with air. Dry ingredients are sifted and folded in gently. During baking, the air expands to rise the cake on its own. It gives extremely light and spongy but less moist cake. It contains egg whites and no egg yolks. Preparation starts with beating egg whites until they are firm and adding dry ingredients gently. This cake is very white and delicate. It is often paired with addition of fruits. It is cooled by inverting it on the cooking rack. It is a kind of sponge cake made with whole eggs. In the preparation, eggs and sugar are combined and whipped in the pan kept over simmering water. They are sliced into thin horizontal layers and stacked with alternate layers of cream/frosting and slices to create layered cake. For example, Swiss roll. It does not contain flour. All ingredients are folded gently and poured into a pan that is kept in a larger pan which is partially filled with water. This water bath is arranged to reduce effect of strong heat from oven to this delicate cake. For example, cheese cake. They are chilled instead of baking. The bottom is often crusted with a layer of cake and on the top of it whipped cream and egg white is added. For example, Chocolate mousse. It is a dough often used for preparing both, sweet and savory meals. It contains flour, shortening like butter or oil, sugar, water, and salt. A filling is put inside the pastry and it is baked to get resulting food with crispy coat. There are various pastries made such as short crust pastry, puff pastry, and Filo pastry. For example, pastry is used for pies, puffs, croissants, and tarts. Baked items often look and taste good when paired with fillings and creams, and topped with sauces. They bring tempting presentation to the main cake or bread and also extend their flavor. For preparing savory puffed pastries, ginger-garlic paste is also used. Their texture changes as per the amount of butterfat they contain. The higher the butterfat contents, less whipping is required to get thick cream. Half and Half/Single Cream − It contains around 15% fat. It cannot be whipped as it contains proportion of cream and milk as 50:50. It goes well with coffee or on cereal. Whipping Cream − It contains around 30% fat and it is thick enough to be whipped. Double Cream − It contain around 48% fat. It cannot get whipped well. Various sweet sauces often known as dessert sauces are used with cakes and desserts that take them to the next heights. They contribute flavor and moisture to the dessert. The dessert sauces are made by combining cooked fruit pieces, sugar, and liquid caramel or light alcohol such as wine. Some popular ones are crème Anglaise, classic caramel sauce, chocolate sauce, strawberry sauce, raspberry sauce, blueberry sauce, butterscotch sauce, and fruit curds.